Cobblestone, grass, and cement are heel murderers. My heels get stuck, fall through holes, and get scraped up the wazoo. Satin- and suede-covered are the worst! If I accidentally sink them in the grass, the dirt stains can be very difficult to get out. Enter the SoleMates high heelers! 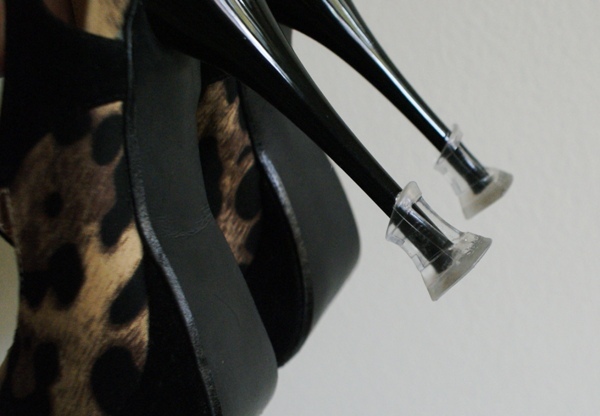 SoleMates are plastic and silicone heel caps that help prevent damage to your heels. I got my pair from Baker's Shoes but you can also get them directly from SoleMates. I bought the classic fit, which fits most heels. They fit my heels really well and are surprisingly durable. I've worn them to walk to sidewalks and on grass, and they're barely scratched up! Ama-aaaa-zing! I can see how these heel caps may not be ideal though. For example, if you have leather-covered heels, they may leave dents in the leather if the fit is tight. Another downside is that the SoleMates high heelers are pretty pricey for such small lumps of plastic. They retail for $9.95. However, if you are really adamant about protecting your heels and wearing them in nature (say an outdoor wedding? ), using heel caps is a great alternative to succumbing to flats or wedges. Use them a lot and get the price per wear down to almost nothing. I give them an A- overall. Do you use them? What do you think of them?